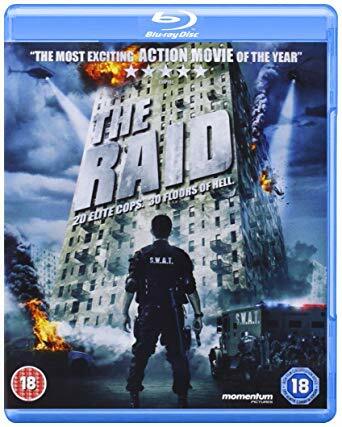 Probably the most talked about action film from the Far East this year, Gareth Evan’s The Raid is released in the UK on Blu ray and DVD by Momentum Pictures. Deep in Jakarta’s most deprived slums stands an impenetrable high-rise apartment block. To many its home to the city’s most dangerous killers and gangsters, including the area’s most notorious crime lord. Even for the bravest and most experienced police officers, it is considered a no-go area. In a desperate bid to flush these violent criminals and their leader from their haven, an elite SWAT team is tasked with infiltrating the building and raiding the apartments floor by floor, taking out anyone who stands in their way. Cloaked under the cover of darkness, the SWAT members make their move and enter the block not realising that this is the easier part of the mission. Once inside, it soon becomes terrifyingly apparent that the real problem at hand is surviving long enough to be able to get out again. The plot of The Raid is simple yet effective. Star Iko Uwais gets to show his action skills along with the stunt team to great effect the knife fighting and close quarter Silat techniques being especially striking and the acting is above average for this type of film. Director Gareth Evan’s does a superb job of ramping up the tension and action, going from ballistic gun battles to brutal knife and unarmed combat sequences. A very satisfying action movie, but be warned it is very violent and pulls no punches. The Blu ray release is 1080P HD, It is a little dark and murky especially at the start but this was probably the director’s intention although detail is lacking in a lot of shots, Blacks are average and the colours are subdued, again probably intentionally. The sound is excellent with a DTS 5.1 HD mix which is expertly used throughout the film, as you can imagine the gunfire and other action scenes really use the full soundstage well, with a thumping bass which tests your sub-woofer! Extra’s are well represented with two audio commentary tracks, although the Blu ray cover only mentions one! Gareth Evans’ solo commentary is excellent, full of details about the making of the film etc. The alternate commentary, accessible using the audio selection button on your Blu-ray remote, is with Evans and Joe Taslim (who played Jaka). Also in the extra’s is a Q&A With Evans along with Shinoda and Trapanese who did the music track. At 40 minutes it again goes into details about the film, the new music score etc. It great that Evans is not shy on mentioning his influences such as Jackie Chan and John Woo, but like Tarantino before him, he puts his own spin on it, making it seem fresher and more original. One of the disappointments is the omission of the original music soundtrack. Two cuts of the film are present (on the Blu Ray only, the DVD just has the UK theatrical cut), the UK theatrical and the ‘Fully Uncut Version’, but I could not spot any difference between the two. Why the uncut Indonesian film could not include the original music is baffling. Overall a good release, the picture quality of the Blu ray is a little disappointing as is the lack of original soundtrack but this should not put you off purchasing this disc. The Blu Ray is locked to region B.